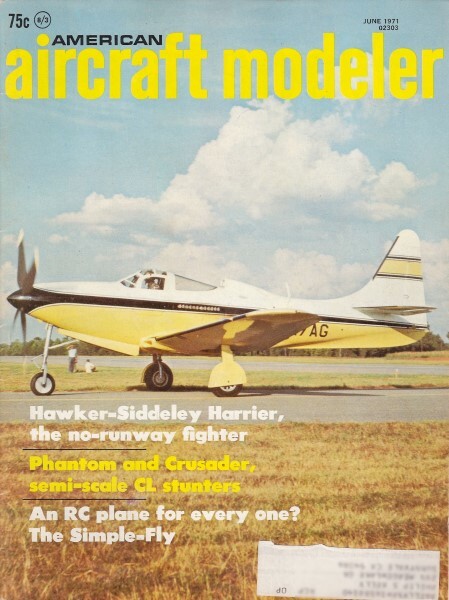 A modern miniature radio control system rather than a galloping ghost setup and a brushless motor rather than a glow fuel engine would be a great combination for this scale Sopwith Pup from the June 1971 edition of American aircraft Modeler. Joe Hankes' 33" wingspan version of this World War I biplane is in the manner of the late 1960s very solidly constructed in order to withstand the grueling pounding of internal combustion engine powerplants. With a little judicious material substitution the airframe weight could be whittled down considerably. Fly it with small digital, Galloping Ghost, or go free flight! Any way, it flies slowly and looks real. The air war, during WW I, was waged on a month-to-month basis. 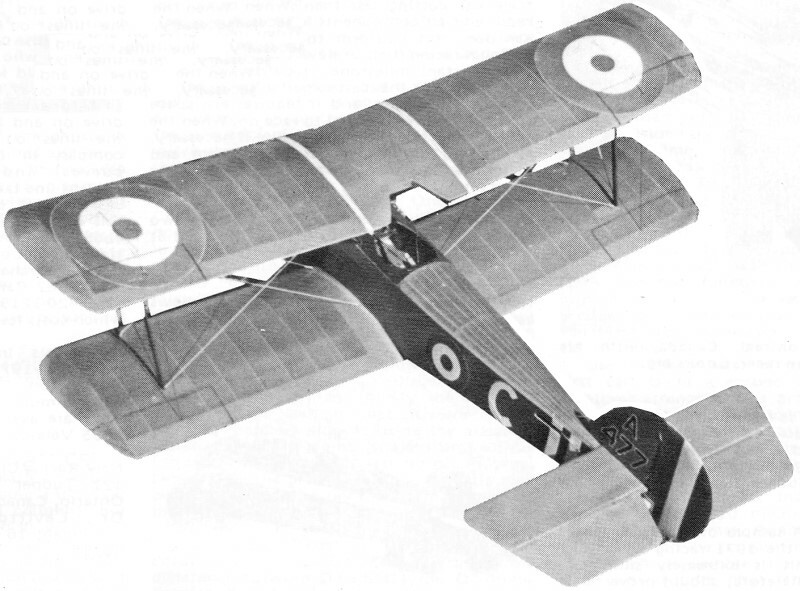 From 1914 to 1918, an aircraft design was effective for about four months. A plane gradually built up to its peak of operation, stayed there for about four to six months, and then slowly declined into obsolescence. In 1915, the German Fokkers, equipped with a machine gun which fired through the propeller, were knocking down Allied planes with ever-increasing regularity. A ship capable of combating them was desperately needed. The Sopwith Aircraft Co., Ltd., worked feverishly to replace their now-obsolete Sopwith 1 1/2 Strutter. 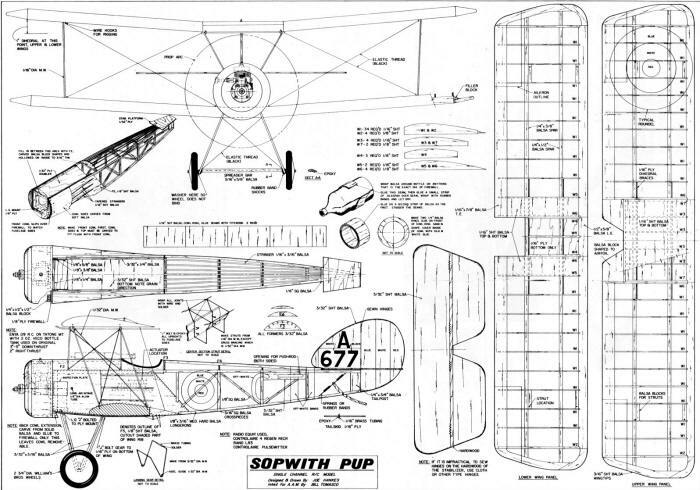 Finally, in January 1916, the plane which was to become known as the Pup first flew. By February 6, 1916, acceptance papers were signed and production of this little jewel began. 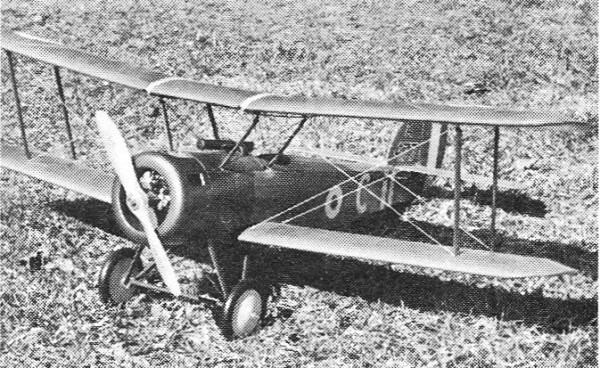 The Pup, which spanned 26 1/2 ft., was a much smaller plane than the 1 1/2 Strutter. Using an 80-hp Le Rhone engine, its all-up weight was 787 lb. Later, performance was bettered with a 100-hp engine at only a slight increase in weight. Early in March, the new planes started to reach the Front. Pilots in the English Sector, who were the first to receive the Pups, were jubilant over their performance. They were easy to fly as compared to the Camel, which had bad spin characteristics. This little Pup could take off with a run of only 100 ft. and came in for a landing at only 30 mph. 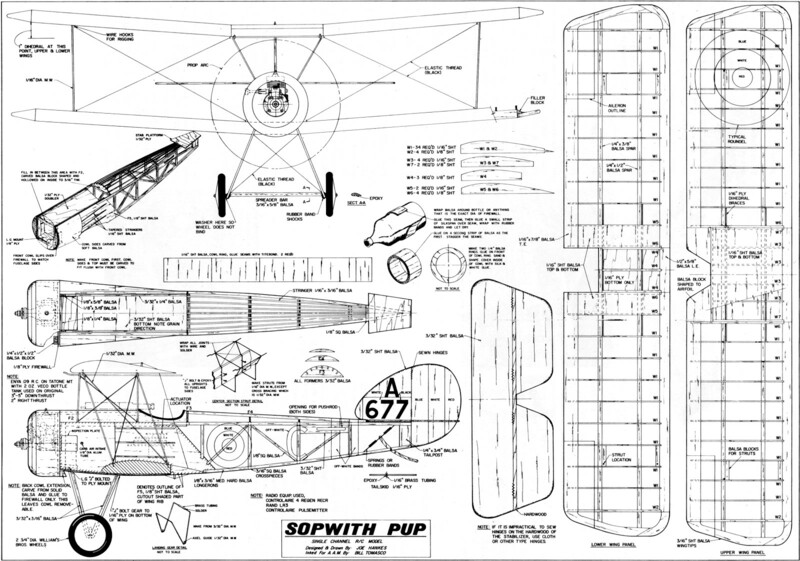 The plane got its nickname from the pilots who considered the Sopwith 1 1/2 Strutter the Dad, and the new plane the Pup. The British brass thought that Pup was an undignified name and gave orders not to use it. But the order was never heeded. The model of this jaunty and frisky little plane was designed with pulse proportional (Galloping Ghost) in mind. Wing loading comes to only 11.4 oz. per sq. ft., since the total weight is 24 oz. ; total wing area, 394 sq. in. An Enya 09 RC engine does a respectable job of flying the plane in scale-like fashion. The large control surfaces may cause some eye-popping at first, but only the inner holes on the Rand actuator and the outer holes on the control horns are used. Total throw is about a half an inch. Those who are brave can use full throw, put in a 15 engine, and get some real combat action. The Pup is a fine fun flier. Its dimensions are not exact enough to win a scale contest but, when that tail lifts on the takeoff, and the ship gently lifts into the air, that's modeling at its best. With reasonable nose and tail moments, the Pup has always been a modeling favorite. While author made a built-up balsa cowl, an aluminum kitchen pan also might work. Fuselage: Cut out 2 parts of F5 from a firm grade of 1/8" sheet balsa. Layout the remainder of the side view, using the balsa size indicated on the plan. Glue each joint well with white glue and let dry overnight. Make the other side view the same way. Join the sides with the cross-members. I usually sketch the top view on my building board and assemble the sides directly over it. Cut out F3, F4, and F5 and cement or glue to the fuselage. Next install the stringers. Cut out the firewall. For an .09 engine, 1/8" ply will do, but 3/16" ply is more versatile and can be used with the larger engine. Use epoxy to fasten the firewall to the fuselage and let set overnight. The firewall must be exact in size. Find a can, bottle, or anything the same diameter as the completed firewall for construction of the cowl. Details are covered on the plan. Note that two layers of balsa will form the ring. Seams on the two layers are staggered, but the grain must run the same way. Add the 1/4" balsa rings in front. Let dry, then carve and sand to shape. Silk is glued on the inside ring part of the cowl to add strength and rigidity. Do not glue any silk where the rear edge of the cowl fits on the firewall. It might make the fit too tight. Carve and sand the side blocks behind the cowl, but do not glue them in place. Next carve the top of the fuselage in one piece and hollow it out to about 3/16" thickness. It fits in the space from the rear of the firewall to the rear of the cockpit. Bend and shape the center section struts. Note the 1/32" music wire cross-bracing. Solder all joints. Then line the inside of the fuselage in area F5 with 1/32" ply, using contact cement for adhesive. Fit the landing gear mount to fuselage and epoxy well. Add the blocks in the corner to attach the mount to the firewall securely, since this area is one of great stress. Install the center section struts to fuselage using J bolts and epoxy well. Glue cowl blocks to fuselage side, then add the stringers. Make the tail skid as shown. A wire one would do, but this one duplicates the real one. Put a 1/8 x 1/4" strip inside the fuselage along F5 (on top of the fuselage) to act as a stiffener. The fuselage is then complete. Stabilizer and Rudder: The stabilizer and rudder are cut from light C grain stock and all the edges rounded. Use hardwood for the elevators. Attach firmly, using epoxy only. I used heavy dacron thread to sew on the hinges, but any good hinges may be used. They must operate freely since pulse flying will not tolerate any stiffness. Wings: The center section of the lower wing is built only from the leading edge to the rear spar, the rest is omitted. This section must key into the wing saddle accurately and its bottom is covered with 1/16" plywood. On the top wing, the center section is covered top and bottom with 1/16" balsa. I key the front of each rib into the leading edge about 3/32" because it adds considerable strength. When both wings are complete, sand thoroughly to make a smooth covering job. Covering: For a more realistic effect, I used silk, which must be shrunk with water to draw it taut. However, any covering material desired may be used. Doping: To keep the plane light, I used five coats of 50-50 butyrate dope clear. For a tinted coat, Rit dye can be blended into the dope as follows. Soak the yellow dye in a small amount of water and strain through a nylon stocking. Do the same with the cocoa brown dye. Then mix the two, using mostly yellow with the brown as a tint. Stir in an amount of denatured alcohol equal to the liquid tint. Mix with the dope and spray evenly over the clear dope finish. Colored dope could be used, but go easy on it to prevent excessive weight buildup near the tail. The authentic color of the cowl and fuselage top is aluminum. Struts may be a clear finish such as that produced by an orange shellac. Paint on the roundels, or use decals. 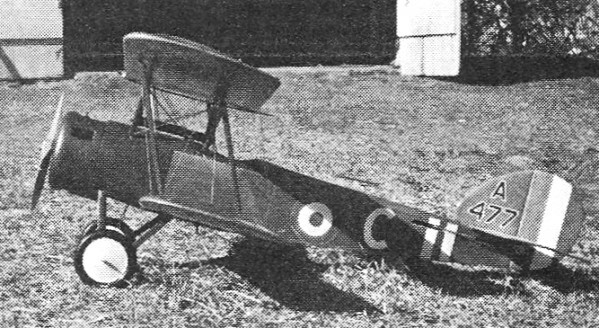 Squadron markings differed greatly, and any authentic color scheme may be used. Assembly: Bend the 3/32" music wire landing gear as shown. Epoxy the lower wing onto the fuselage and let set overnight. Incidence must be 0 degrees. Jig up this assembly so that it lines up from the top, side, and front. Then J-bolt the landing gear in place. Fill in the bottom of the fuselage with 3/32" sheet balsa and dope to match the rest of the paint. Cut and glue on the stabilizer platform, then the stab. When putting on the rudder and vertical fin, cut two notches into the top of the stabilizer. Make two corresponding notches on the vertical fin and cement in place. The vertical fin must be cut about 3/32" longer to allow for notching. Make the wing struts. Rubber band the upper wing into place, and install the struts and rigging. My rigging was elastic thread inked black and removable for flying. Install the Tatone engine mount, centering the crankshaft on the center of the cowl. Cut out appropriate openings for the engine head and the exhaust. A small hole may be put in the bottom of the cowl for an oil drain. Make the opening around the engine head a little larger to insure adequate cooling. The two-oz. Veco tank lies horizontally behind the firewall above the radio equipment. Radio gear and its installation is up to the individual. I used a Controlaire 4 receiver, with a Rand pack and it operates flawlessly. Carve and sand the spreader bar and groove out for the 3/32" music wire axle. Epoxy it in place. When set, rubberband the bar to the landing gear. Slip on the wheels and solder the retainers. The scale-size wheels are 2 3/4" (I used 3" because that is all that was available). The top of the fuselage from the firewall to the rear of the cockpit is fastened on the front by a music wire pin through the firewall into the balsa, and in the rear by a bolt to a crosspiece in the fuselage. The crosspiece is located near the front of the Rand actuator. Check out the pulse system so that the elevators and rudder pulse are in neutral. Hang the airplane by a string located at the center of gravity and correct any wing heaviness. When the CG is within bounds, the Pup is ready to go. With the Enya going full blast, I began the first flight by signaling for the release. I gave it a bit of forward stick and up came the tail. After almost 75 ft., the ship lifted and climbed out. Since it always wanted to turn left, a little more right thrust was needed. After about a minute of flight, I eased the ship onto the final and throttled down. With a little trim, in it came. There was a decided ballooning tendency on the flare-out on landing. Take it easy on the control movements. Biplane fans have a lot of enjoyment in store for them. If flying with three servos, use 3/32" wire on the center-section struts. No rigging or struts were used for flying; however, they could be if made light in weight.